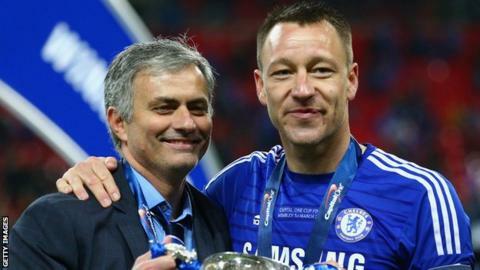 Player power was not behind the sacking of manager Jose Mourinho, says Chelsea captain John Terry. Mourinho was dismissed on Thursday with the club 16th in the Premier League. Guus Hiddink has been appointed as his successor until the end of the season. Writing in the Chelsea programme before the game against Sunderland, Terry said: "We are aware there have been rumours about player power, but I want to make it clear that is not the case." The 35-year-old central defender added: "We leave all the decisions to Mr. Abramovich and the board and know our job, as players, is to focus on getting results on the pitch." Chelsea have appointed Hiddink as Mourinho's successor in a interim capacity until the end of the season - the second time the Dutchman will have performed the role after succeeding Luiz Felipe Scolari in 2009 and leading the club to an FA Cup triumph. Also writing in Saturday's matchday programme, chairman Bruce Buck said that the decision to end Mourinho's second spell at the club was not one he or owner Roman Abramovich had taken "lightly". "The start we have made to the season has come as a major disappointment to the owner, the board and Chelsea fans everywhere and I think it is fair to say nobody expected us to be in the position we are in the Premier League just before Christmas," said Buck. "The difficult decision was made for Jose Mourinho to leave the club. I can assure you it was not a decision we took lightly. Nor was it a spur of the moment decision. Mr. Abramovich and the board agonised over it for some time. "We are one of the biggest clubs in the world and we are all determined, as a collective unit, to get back to where we should be." Chelsea have lost nine of their 16 league games this season.